Over at Charisma Cardz they a running a 'Things with Wing' challenge and I thought I have a go. I am still trying my hand at Tags and smaller papercraft items like ATCs and inchies and this is my effort for today. 'Things with Wings' - birds, butterflies, time , hearts...a bit of an art-smash going on here AND I got to mess around with inks. I used the Tim Holtz Tags and Bookplates die to make the base using light brown cardstock. I adhered the old paper to the base, roughened the edges and then sponged the tag with a mixture of Forest Green, Tumbled Glass and Vintage Photo inks. The bird and branch were stamped in Forest Green distress ink and the cage was cut from green cardstock using the MemoryBox Wired Bridcage die. Some more distressing and a torn heart was tucked behind the paper and stamped with clock face. 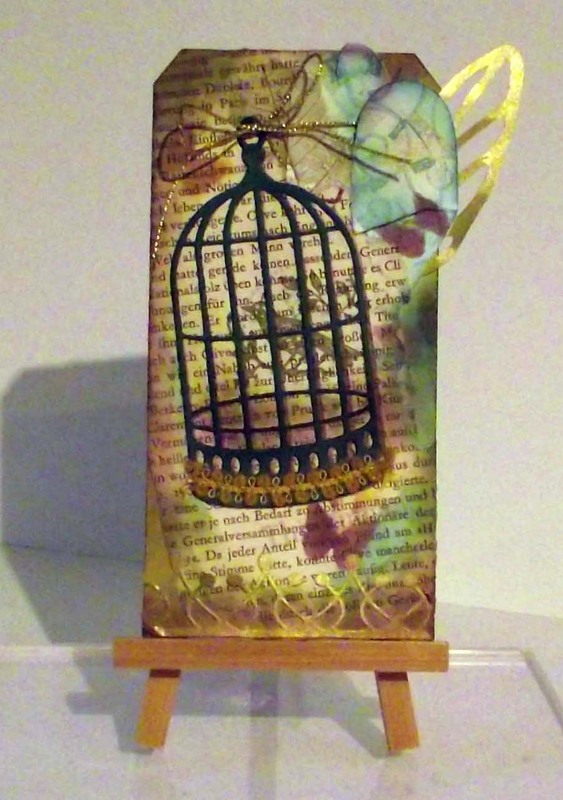 A gold wing was added from the Tim Holtz Fanciful Flights die. 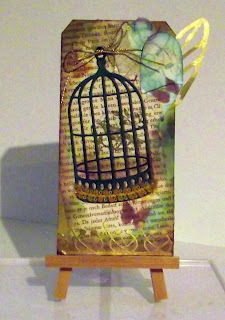 The tag was finished with a mask made using the Butterfly punch from Martha Stewart and inked here and there in Violett ink, gold braid to decorate the base of the cage and the bottom of the tag has a border made with the MemoryBox Pristine Borders die cut from gold backing paper. Thanks for stopping by to read my blog, I appreciate your time and your comments. Stamps:Cavillini Papers and Co - Birds and Nests and Rayher Vintage stamps.